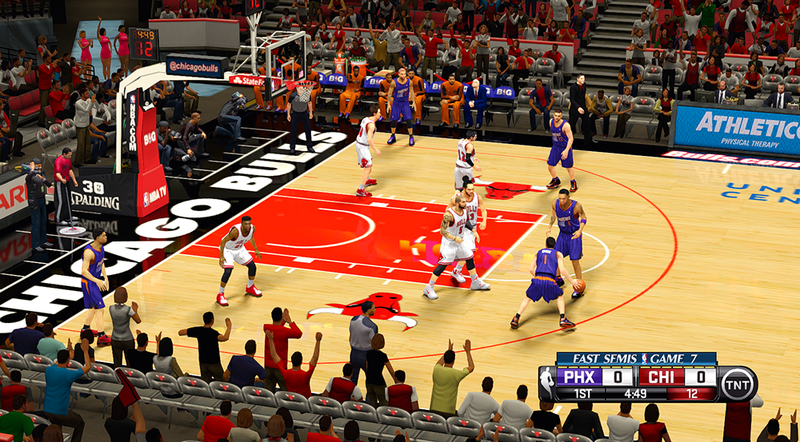 An add-on to the first TNT scoreboard for NBA 2K14 PC. 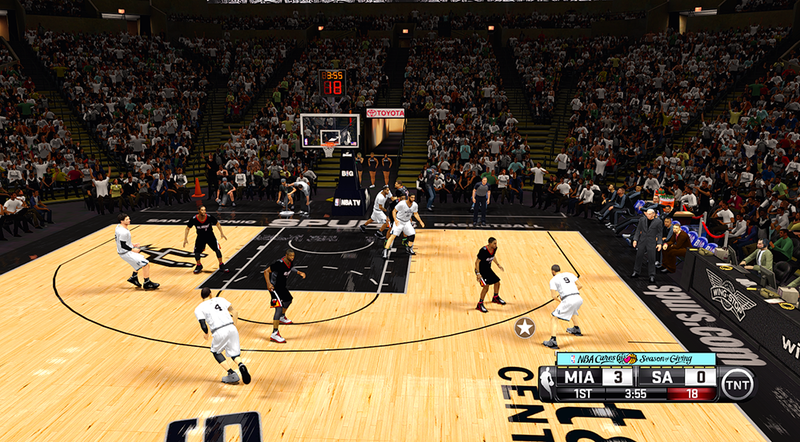 Main difference between this and the version of exrxixxx is the bar at the upper area of the scoreboard. NBA Cares "Season of Giving"
Eastern Conference First Round - "1st Round | Game #"
Western Conference First Round - "1st Round | Game #"
Eastern Conference Semifinals - "East Semis | Game #"
Western Conference Semifinals - "West Semis | Game #"
Eastern Conference Finals - "East Finals | Game #"
Western Conference Finals - "West Finals | Game #"
Playoffs versions: New design with blue background color for the East and red for the West. You're gonna need to install them manually as the game number and the division doesn't change or update on its own. 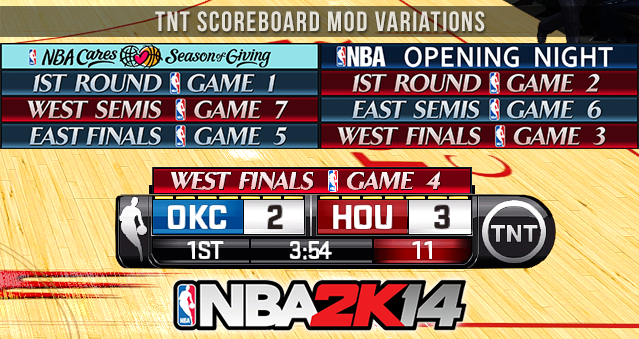 Note: As in real life TNT doesn't broadcast The NBA Finals so I won't do a scoreboard with The Finals colors. 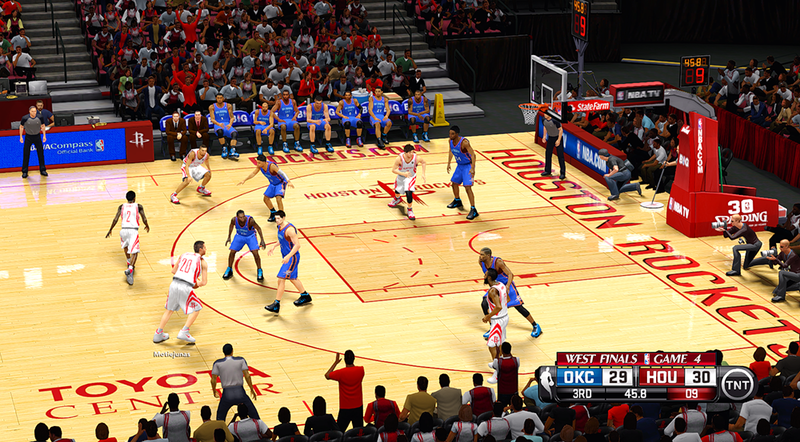 - Extract the file, choose your preferred version of the scoreboard and copy it to main NBA 2K14 game directory - Program Files\2K Sports\NBA 2K14.